The figures used for this unit are Star Wars figures from the Starship Battles release. The figures' names are 50/Geonosian Starfighter and 51/Geonosian Starfighter Ace, although some online retailers misspell Geonosian as "Genosian". Character Bio: Utgar turns to Alpha Prime once again and find hyper fast flying probes to take care of dangerous targets. Look out Valhalla, there are now bombs in the Sky! A Zettian Deathwing that moved but did not attack normally may use Detonation Special Attack. Any figures adjacent to the attacking Zettian Deathwing are affected by Detonation Special Attack. Roll 5 attack dice for all affected figures. 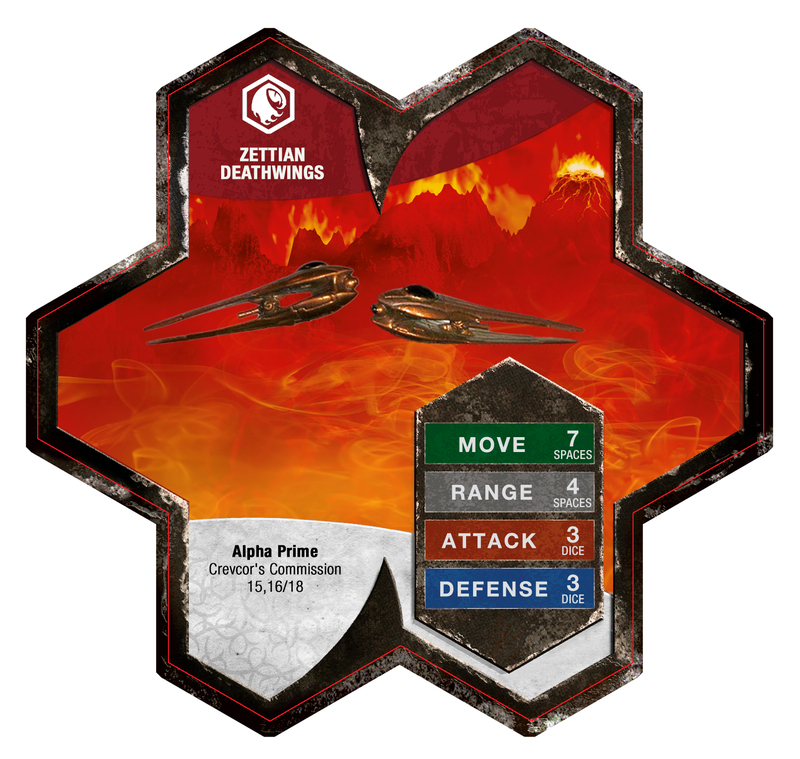 Destroy the attacking Zettian Deathwing before each figure rolls defense dice separately. When a Zettian Deathwing rolls defense dice against an attacking figure who is not adjacent, add 2 defense to the defending Zettian Deathwing. When counting spaces for a Zettian Deathwing's movement, ignore elevations. A Zettian Deathwing may fly over water without stopping, pass over figures without becoming engaged, and fly over obstacles such as ruins. When a Zettian Deathwing starts to fly, if it is engaged it will take any leaving engagement attacks. After moving and attacking with Zettian Deathwings, each Zettian Deathwing you activate this turn may move up to 3 spaces. Q: If I do not move and/or do not attack with a second Deathwing, can I still move it using Hyper Speed Burst 3? A: Yes. "After moving and attacking" refers to when in the turn the power takes place. Moving and/or attacking are not requirements to use the power. If you have activated only one Deathwing in the turn, you may choose an additional Deathwing to activate and use Hyper Speed Burst 3. Q: If a Zettian Deathwing uses Detonation Special Attack while adjacent to Isamu, is the Deathwing removed before or after the roll for Vanish? A: The players roll off using the 20-sided die to decide which happens first. The destruction of the Deathwing happens at the same time as the roll for Vanish so the rule for simultaneous powers applies. This applies to all "at least 1 skull is rolled" powers that work against special attacks: Flutter, Spider-Sense/Spidey-Sense, and Vanish. As Soulborgs who follows Utgar, Zettian Deathwings may benefit from Deathcommander Mark 3's MARKED FOR DESTRUCTION special ability. As Small figures who follow Utgar, Zettian Deathwings may benefit from Morgoloth's SWARMING VERMIN ability. TORIN: EVIL EYE PROTECTION : As Small Utgar figures, the Zettian Deathwings may benefit from Torin's EVIL EYE PROTECTION Defensive Ability. Zettian Deathwings can be exploded by Executioner 616. As small figures, Zettian Deathwings are immune to Warden 816's EVISCERAXE SPECIAL ATTACK. Last edited by superfrog; January 22nd, 2019 at 02:10 PM. Reason: Added Basic side and new pdf; Permission received. Point out any inconsistencies. Much depreciated. 4 powers!? Now to look at the other cards lol. Is there any way to possibly rebase these guys? Anyway, at first glance they look 10 times better than the Zettian Guards. In any sense that is a good thing. Good job C3V. They capture the feel of flying bombs extremely well. Looking forward to picking these up. Are we forced to attack with a deathwing to use their Hyper Speed Burst 3 ? i.e. is it possible to move a deathwing of 7 (4 + 3) hexes even if it hasn't attacked this turn ? No. Like with Silver Surfer (like the power is based on), it just tells you when you can use it. After your 2 Deathwings have attacked, you can move one or both of them. You don't need to attack to boost. It just tells you what phase you can use the boost; after the Attack Phase. I think what he means is, you can attack the rats (causing them to scatter), and then hyper further out with the Zettians, causing one and a half OM's of movement for one OM pretty much. The phrase "even if all Deathwings have been destroyed" seems to be doing more harm than good. It's inconsistent with other cards, and rather than clarify anything for me it had me re-reading the card multiple times to try to figure out what what I was missing ... what subtle interaction with some obscure rule or other unit was not apparent to me? I'm guessing this sentence is there because somebody was worried that players would think they have to stop reading the game text in the middle of a sentence when the last ZD blows itself up, but realistically only the most extreme kind of rules lawyer would try to make that claim. Consider units like Finn, Thorgrim, Eldgrim, Thanos ... they don't explicitly say their game text keeps working after they are destroyed, because it's 100% clear they are intended to do that very thing. Same with the Deathwings. So here's a good opportunity to reduce the word length on a crowded card, and save people from scratching their heads and wondering what's the obscure reason for the anomalous phrase. says "After taking a turn with Silver Surfer," but this card says "After attacking with a Zettian Deathwing." Completely different connotation there. You can take a turn without attacking (and you can even "move 0" for the effects that say "after moving"), but there's no way to "attack without attacking." Since attacking is the last part of the turn anyway, the only reason to say "after attacking" (instead of "after taking a turn") is because you want to require attacking. If the design intent was that you don't have to attack, then that intent is not communicated by this wording. If it's supposed to work like Silver Surfer, it should be worded like Silver Surfer. Last edited by Just_a_Bill; April 29th, 2015 at 11:58 AM. The reason for "even if all Deathwings are destroyed" is that generally, powers only work while a unit is still alive. You're right about Thanos and Finn and the rest, but here it falls into a gray area. I'm not sure whether you can move with Hyper Speed without attacking, though. I'll fix the OP here shortly. The phrasing is to allow you to roll dice if you destroy your last Zettian. As I understand it you can use before attacking powers without attacking so why couldn't you use after attacking powers without attacking? Maybe the wording was changed for them being Commons so people don't think they can move 4 Deathwings in total with Hyper Speed Boost--you gotta move the ones you attacked with (or would've attacked with). Somebody get an expert in here! EDIT: Also, is there a reason the Deathwings kill themselves before rolling dice instead of after? It seems like that would remove the need for the "even if all ZDs are destroyed" clarification.